Play Shooting Stars Supernova online for free now! 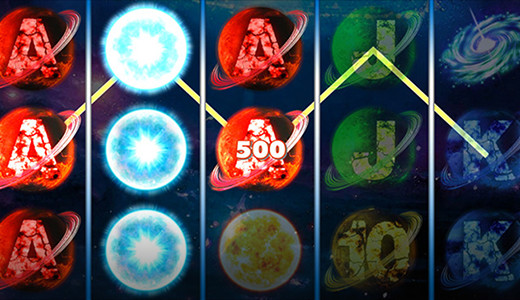 You can seek and find your gaming luck in the stars with Shooting Stars Supernova on 5 reels and 10 lines. Keep an eye on the sun symbol as it pays the highest winnings! The blue star acts as a Wild symbol and substitutes for all symbols in the game; but it only lands on reels 2, 3 and 4. It also triggers the Shooting-Star-Bonus. One blue star in any position on reels 2, 3 or 4 is enough to trigger the Bonus feature. During the feature all other symbols of the reel it has landed turn into blue stars as well. Afterwards the blue stars are fixed and the remaining reels spin again. If another blue star appears, the process is repeated. If no more blue stars land the regular game starts again. 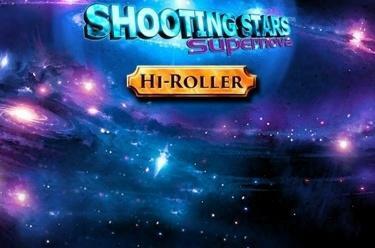 You can choose between two Hi-Roller-Modes in Shooting Stars Supernova: the Silver and the Gold mode. If you opt for the Silver mode you play with 5 times the standard bet. In this mode stacked Wild symbols appear on reels 2, 3 and 4. If you select the Gold mode you play with 10 times the standard bet; stacked Wild symbols appear on all 5 reels here! You will take home a meteoric win if you manage to land 5 matching winning symbols on one of the up to 10 pay lines. Regardless if the symbols land from left to right or right to left. Are you ready for some Twist explosions? Shooting Stars Supernova brings thousands of sparkling stars on your screen! Let ringed planets and comets travel along their orbits and let giant blue stars be fixed points in the sky of winnings - with a little luck you won't just witness supernovas but also meteors shining brightly that bring you stardust loaded with Twists!